Historians, both veterans and newcomers, recently gathered at the 2015 Texas State Historical Association conference in Corpus Christi. UT Austin, past and present, was well represented. Veteran Tejano historians Roberto Villarreal, Andres Tijerina, and Emilio Zamora attended, all of whom were part of the 1973 UT Austin MA Program in History, the first significant cadre of Tejano graduate students, following Carlos Castaneda and Jovita Gonzalez from decades before. At breakfast, Villarreal spoke of obstacles various historians placed before him to prevent his success. Today, Dr. Tijerina and Dr. Zamora are co-editing the forthcoming Tejano Handbook of Texas. 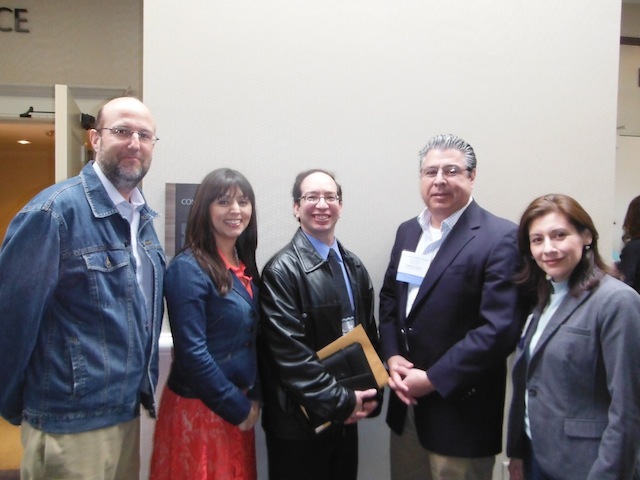 Dr. Arnoldo De Leon, previous advisor to the Tejano entries of the Handbook’s 1996 edition, was also present as was Jesus F. de la Teja (UT PhD, 1988) who talked about his past role as a Texas State Historian. Dr. Carlos Blanton celebrated the recent publication of his book on UT’s Dr. George I. Sanchez, and Dr. Gabriela Gonzalez celebrated the publication of her essay on Jovita Idar in Texas Women: Their Histories, Their Lives. Most encouraging was that for the first time a significant number of Latinas employed in history departments in Texas and elsewhere presented or attended. Present was Dr. Maritza de la Trinidad (UT Pan American); Dr. Laura Munoz (Texas A & M Corpus Christi); Dr. Gabriela Gonzalez (UTSA); Dr. Monica Munoz Martinez (Brown University); Dr. Sonia Hernandez (Texas A & M College Station); Dr. Cynthia E. Orozco (ENMU Ruidoso); and Dr. Caroline Castillo Crimm (retired, Sam Houston State University, UT PhD, 1994). 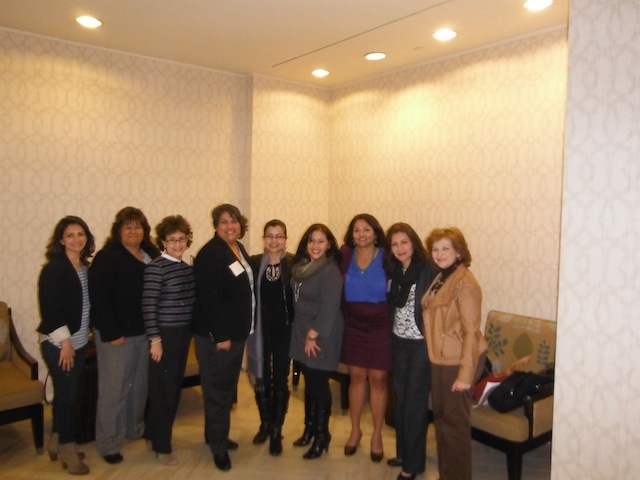 English professor, Dr. Patricia Portales and doctoral candidate, Cecilia Venerable (UTEP) also presented. Other Tejanas conducting historical research also attended. Writer Dr. Carmen Tafolla and lawyer Sharyll Teneyuca spoke about labor activist and intellectual Emma Tenayuca. Archaeologist Dr. Mary Jo Galindo spoke about her grandmother, Mexicanist activist of San Antonio and Lytle, Texas, Maria L. Hernandez. Several sessions were outstanding, including Grassroots Tejano History in Austin, San Antonio, and Laredo; Border Violence, 1915-1919; Tejana leaders; Dr. Hector P. Garcia; and Corpus Christi archives. 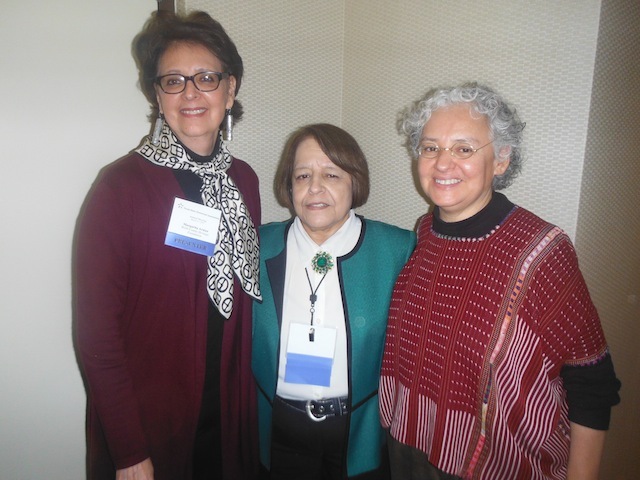 Latinas involved in Public History — historical preservation, public programming, and archival collections — were there too. These included Dr. Nancy Vera (Corpus Christi); Graciela Sanchez (San Antonio); Gloria Espitia (Austin); and Margarita Araiza (Laredo). All are key to grassroots Latino historical preservation, public programming, research, and archival preservation in their respective cities. The Hispanic Heritage Center of Texas, a grass-roots institution, organized a session on South Texas’ role in Tejano-Mexicano culture. Founded in 2008, it focuses on the 17th, 18th, and 19th centuries. Efforts by Laredo, Austin, and San Antonio community activists to preserve and promote Tejano and Tejana history were addressed. Margarita Araiza of the Webb County Heritage Foundation noted that historical fallacies are still being promulgated: Texas Monthly reported that Stephen F. Austin was the father of Texas and that the US cattle ranching industry was born in the 19th century, facts negating Spanish and Mexican presence. The Webb County Heritage Foundation in Laredo works to preserve historic architecture and maintains the Villa Antigua Border Heritage Museum and the Republic of the Rio Grande Museum. It also sponsors a young archivist program along with a Cine de la Epoca de Oro (Mexican Golden Age movies), tours, and has succeeded in getting Laredo local history into the common core at public schools. Its publications include a Laredo Legacies booklet, a Haunted Heritage book, and pamphlets on Leonor Magnon de Villegas and Jovita Idar. The foundation presented its ten minute professional video on Magnon de Villegas. Gloria Espitia, previously of the Austin History Center, reported that ordinary folks do not consider their materials “historical.” She spoke about exhibits she coordinated: Diez y seis; an Elderly Oral History Project (assisted by Professor Maggie Rivas-Rodriguez of UT); Quinceneras; Mexican American Firsts Trailblazers; Austin Brown Berets; and Latina Musicians. She also spearheaded an oral history project with Martin Middle school to document the thirty year effort to create the Mexican American Cultural Center in Austin. Graciela Sanchez, of San Antonio’s Westside Preservation Alliance, spoke on efforts to save the La Gloria building and the KCOR Spanish-language radio station building, both unsuccessful efforts. The organization has published pamphlets about Mexican-descent women singers and has reproduced historic photos for outdoor public display. Dr. Nancy Vera reported on her singular efforts to produce a Corpus Christi Mexican American virtual museum online. Interviews she conducted with local historical figures can be found there too. One of the most important sessions focused on a public history project by historians in collaboration with the Bob Bullock Texas State History Museum. In commemoration of the 1915-2015 anniversary of racial violence in South Texas by the Texas Rangers and others, a group of historians are working on a project to give attention to murders suffered by Mexican descent people. Dr. Monica Martinez informed the audience of their website “Refusing to Forget” which includes a map of Texas’ racial violence against Mexicans. Dr. Trinidad Gonzales said his great grandfather was killed in the matanza. He discovered a report of his death in a 1929 edition of El Defensor, a Spanish language Edinburg newspaper published by Santiago Guzman. The panel reported on attempts to obtain historical markers commemorating the conflict. County control has censored some Tejano markers. Edwards County denied a marker about Antonio Rodriguez’ lynching in Rocksprings in 1910. Likewise, the Presidio Historical Commission denied one about the Porvenir Massacre of 1918. County historical societies have had decision-making power and conservative European Americans would like to prevent historical discussion. In contrast, Cameron county approved the “Matanza, 1915” marker but changed it title to “Victims of an Undeclared War, 1915.” And markers approving Jovita Idar and the Primer Congresso of Laredo, the first major Mexicanist civil rights congress, were approved by Webb county. Another historical session focused on twentieth-century Tejana leaders. Carmen Tafolla and Sharyll Teneyuca reported on labor activist Emma Tenayuca. Intrigued by politics by age 15, she became active early. While her work with the pecan sheller strike of 1938 is well known, fewer know of her work as a teacher. She obtained her teaching certificate in 1952 and taught at Catholic schools and Harlendale in San Antonio. In 1974 she obtained a masters at Our Lady of the Lake but retired in 1982. Mary Jo Galindo noted that her grandmother Maria L. Hernandez worked in conjunction with her husband all her life. In the mid-1920s she had a midwifery certificate and in 1936 helped form the Asociacion Protectora de Madres and the Clinica de la Beneficiencia Mexicana. In 1939 she was a goodwill ambassador to Mexico and, as a result, the Mexican government gave the clinic an x-ray machine. In the 70s she attended Raza Unida Mujeres events with her husband though men were not permitted. Cynthia Orozco talked about Adela Sloss Vento, a LULAC ally (League of United Latin American Citizens) and one of the most significant Mexican American civil rights leaders and public intellectuals in the 20th century. Based on Sloss Vento’s archives, Orozco and Dr. Arnoldo Carlos Vento are completing a book manuscript on her work from the 1920s through the 1980s. Sloss Vento wrote to US and Mexican presidents, Congressmen, and state legislators to seek racial desegregation and improved lives for immigrant workers. Dr. Cynthia E. Orozco (UT BA, 1980) chairs the History, Humanities, and Social Sciences Department at Eastern New Mexico University, Ruidoso. She is the author of No Mexicans, Women or Dogs Allowed: The Rise of the Mexican American Civil Rights Movement (University of Texas Press, 2009) and a TSHA Fellow.